North Korea has at least eight industrial facilities that can produce chemical agents, and probably nearly twice this many; however, the production rate and types of munitions are uncertain. Presumably, sarin, tabun, phosgene, adamsite, prussic acid and a family of mustard gases, comprising the basis of KPA chemical weapons, are produced here. North Korea has the capability to produce nerve gas, blood agents, and the mustard-gas family of chemical weapons. LOC - Chemical Weapons North Korea Country Study Library of Congress, 1993 " ... by the late 1980s as many as eight industrial facilities capable of producing chemical agents had been identified; they were located at Anju, Aoji, Ch'ngjin, Hamhng, Manp'o, Sinhung, Siniju, and Sunch'n. There were three research institutes; they were located at Kanggye, Siniju, and near Hamhng"
UMA - Chemical, Biological Weapon Capabilities on Korean Peninsula : JPRS-UMA-94-045 : 2 November 1994 " ... there are at least eight industrial enterprises at which chemical agent production is possible. Mentioned among them are installations near the cities of Chongjin, Hamhung, Yonan, Hungnam, Kusong, Pyongyang, Sunchon and Nampo..."
TND "Weekly Assesses DPRK Nuclear War Preparations," JPRS-TND-94-015 : 30 June 1994 "North Korea's chemical weapons-related organizations include the Humhung branch of the Academy of Defense Science; Kim Il-song University; the Chemical Department of Pyongsong College of Science; the Chemical Research Institute under the Second Academy of Natural Science; the Central Analysis Center at Pyongsong Academy of Science; the 398th Research Center and the 279th plant under the Nuclear-Chemical Defense Bureau; the chemical plants in Kanggye, Sakchu, Hyesan, Wonsan, and Hamhung; the 8 February Vinalon Plant; Sunchon Vinalon Plant; and Sariwon Potash Fertilizer Plant." CJH North Korean Mass Destruction Weapons Choi Ju-hwal, OCTOBER 21 1997 "The Hamhung Branch and three other institutes under the Second Natural Science Academy are responsible for research ... factories include the Kangye Chemical Factory in Jangang Province, the Sakju Chemical Factory in North Pyongan Province, the ``February 8'' Vinalon Factory in Hamhung, North Hamgyong Province, the Ilyong Branch of the Sunchon Vinalon Factory in South Pyongan Province, the Factory No. 297 in Pyongwon, South Pyongan Province. There are other chemical factories in Bongung, Hamhung City, South Hamgyong Province, Hyesan City Yanggang Province, and Kangye City, Jagang Province." JB - The Armed Forces of North Korea by Joseph S. Bermudez Jr (February 2001) -- Joseph S. Bermudez is the internationally recognized analyst, author and lecturer on North Korean defense and intelligence affairs. This book provides the most authoritative and detailed available description of the DPRK's armed forces, paramilitary and internal security forces, intelligence services and weapons of mass destruction. Facilities associated with chemical-agent production include Anju, Aoji-ri, Ch'ongjin, Hamhung, Hwasong-up [Hwasun-ni? ], Manpo, Sakchu, Sariwon, Sinhung, Sinuiju and Sunch'on. These two CW factories at Kanggye and Sakchu factories are responsible for filling, packaging and shipping of training and war chemical munitions. Strategic storage facilities are operated by the Chiha-ri Chemical Corporation [at Anbyon] and the Maram Materials Corporation. Maram is headquartered at Maram-dong, and Bermudez suggests that references to CW facilities at nearby Hwang-ch'on and Masan-dong are alternate references to Maram-dong]. Other strategic storage facilities operated by Maram are located at Samsan-dong, Sanum-ni, and Wanjaebong (possibly Wangyun-dong). In an earlier version of this analysis, published in Jane's Intelligence Review in August 1996, Bermudez noted that the ROK Ministry of Defence had identified six special corps munitions depots located at: Sanumni (two sites, III Corps or P'yongyang Defence Command), Hwangch'on (III Corps), Samsan-dong (II Corps or the Artillery Corps), Sariwon (IV Corps) and Wangjaebong (V Corps) -- but this passage is omitted from his 2001 book. The difficulty in specifying the location of some facilities is highlighted by the various spellings of two facilities -- Wanjaebong (possibly Wangyun-dong) in 2001 versus Wangjaebong in 1996, and Hwasong-up in 2001 versus Hwasung in 1996 [a site others apparently report as Hwasun]. Bermudez makes the interesting observation that, while the DPRK almost certainly has a CW test facility similar to the USA's Dugway Proving Grounds, there is no information available concerning any such facility. The production of chemical defence and decontamination equipment is known to occur at only one facility, Factory 279 (or Research Center 279) at Sokam-ri. The 1999 South Korean White Paper states that "At present, North Korea maintains eight chemical factories, four research facilities, and six storage facilities for mass producing chemical agents" without providing further detail or a map of locations. 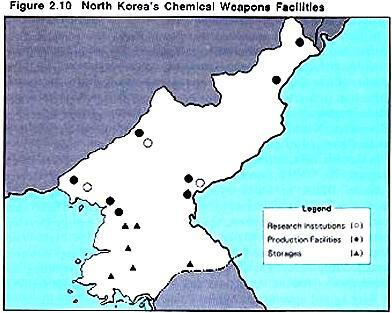 The South Korean White Paper sources provide maps without placenames, and are the only source to indicate the location of chemical weapons storage facilities [the 1997 version of the map clearly transposes the labels for the production and research facilities]. There is generally fairly good agreement between the two version of this map, with the annoying exception of the second production facility in the vicinity of Hamhung [tentatively identified as Sinhung], and the displacement of the coastal facility that is apparently Ch'ongjin. It is not immediately possible to associate specific major North Korean military facilities with the indicated chemical weapons storage site locations on these maps. The locations generally seem to lie in fair proximity to airfields, though this may be entirely coincidental, as both airfields and military facilities generally are profoundly abundant in such close proximity to the Demilitarized Zone, the immediate precincts of which are highly militarized. There is general agreement among these various sources that the North Korean chemical weapons program is centered in three or four research facilities, along with at least seven or eight production facilities, for a total of between ten and twelve locations. The four probable research facilities may be fairly readily identified as being located at Hamhung, Kanggye, Pyongsong, and Sinuiju, in addition to the probable training facility at Hungnam. However, there are as many as fifteen suggested locations for the production facilities. The Library of Congress source uses more than a few non-standard placename transliterations. 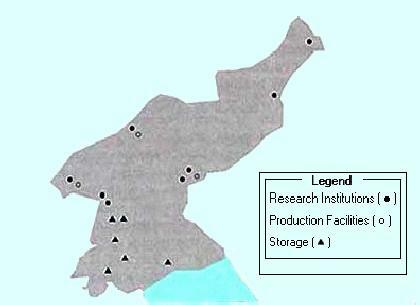 Seven of the nine facilities mentioned in the Library of Congress source can be readily associated with locations on the map from the ROK source. The Sinhung association is ambiguous, since there are several populated places with this placename, the location of one of which is not obviously inconsistent with one of the locations on the ROK maps, the identity of which is otherwise obscure [and the location of which is somewhat uncertain, since the position of this facility differs noticeably between the two editions of the map]. Within the limits of the cartographic license normally associated with such a small map, there appears to be generally good agreement between the LOC and ROK sources. The JPRS-TND source attributes chemical facility locations tot the 1991 DIA publication "North Korea: The Foundations for Military Strength," but the publication itself does not appear to include this information. Furthermore, the JPRS-TND source mentions only three locations attested to by the other sources, and includes some facilities with unidentified locations. It is possible to exclude Kusong, Wonsan and Yonan, which are attested by only single secondary derivative sources of uncertain reliability.